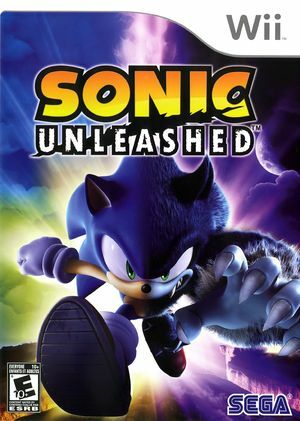 Sonic Unleashed (released as Sonic World Adventure in Japan), is a video game in the Sonic the Hedgehog series developed by Sonic Team and published by Sega for multiple platforms in 2008. The game follows Sonic the Hedgehog as he attempts to restore the world to normal after his nemesis, Doctor Eggman, splits the world into pieces, as well as his struggles with his new beast form, Sonic the Werehog. Gameplay features two distinct styles, with each being played either during daytime or night-time. Daytime stages incorporate Sonic's traditional platforming and trademark speed, with a combination of behind-the-back third-person viewpoints and 2D side-scroller platforming; gameplay seamlessly transitions between these two views. Night-time levels see Sonic transform into the Werehog; gameplay slows down to accommodate greater platform play, and involves combat against waves of enemies using the Werehog's brute strength. Sonic Unleashed is capable of using both GameCube controllers and Wii Remotes. If a physical controller is set to emulate both a GameCube Controller and a Wii Remote concurrently, it will operate both devices at the same time. To fix, migrate controls to use separate physical controllers. Enter this as an AR code in the game's configuration settings. This patch will unlock the game's frame rate from 30FPS on actual hardware to 60FPS. Check "Store EFB Copies To Texture Only.". It may also be advisable to increase the emulated CPU clock to maintain 60FPS rendering. The 60 FPS is graphic dependent, so lowering the internal rendering resolution may be required to maintain 60 FPS. May stop werehog from dashing to one side. The graph below charts the compatibility with Sonic Unleashed since Dolphin's 2.0 release, listing revisions only where a compatibility change occurred. r6634 Windows 7 Intel Core i5-750 @ 4GHz ATI Radeon HD 5870 Around 38+ FPS (unlimited, normal is 30). Full Graphics and Sound.